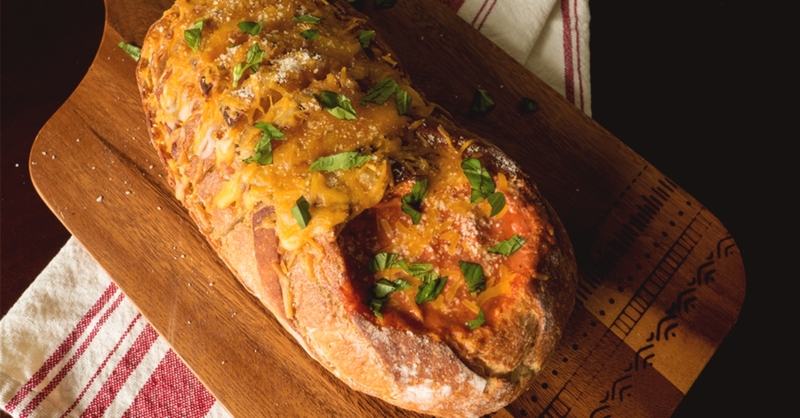 All-In-One Grilled Cheese Tomato Soup Bread Boat! If you’re like us, and love dipping your crispy, oozing grilled cheese sandwiches into a piping hot bowl of delicious tomato soup, then boy do we have a special treat for you! This bubbly bread-boat bake is a little bit of heaven and will totally satisfy your craving for this classic comfort-food combo, while giving you a brand new and totally mouthwatering way to enjoy it! Bust this out for lunch or dinner and you’ll definitely paint some wide-eyed smiles on your family’s faces. If our family’s reactions are any indication, this is a sure-fire hit every time! Trust us, you won’t be disappointed! Place tomatoes and juices in a food processor, adding garlic or onion powders, if using, and pulse until smooth. Using a sharp serrated knife, cut down into the center of one of the ends of the bread and form a large circle, leaving 1/2-inch space at the bottom of the crust. (Soup bowl will be on one end of loaf, grilled cheese slices on the other.) Leave all remaining bread intact. Using a spoon or your hands, pull out all the bread in the circle and set aside. Place bread so that the long edge is facing you and, working your way away from the hollowed out end, make several vertical cuts until you reach the other end. Don’t cut through the bottom of loaf. Make sure to leave hollowed out end intact. In a small bowl, whisk together melted butter and garlic powder. Gently separate bread slices and drizzle butter mixture into the slices on both sides of bread. Take cheddar cheese slices and stuff it down into the bread slices. 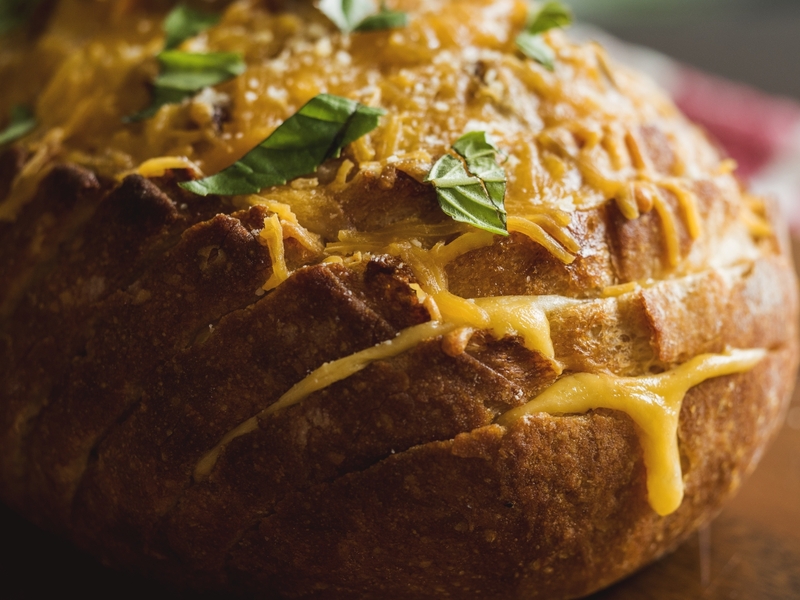 Line bread bowl with remaining monterey jack slices. Pour cheesy tomato soup into hollowed out end and place baking dish in oven. (Optional: sprinkle grated parmesan over the top.) Bake for 20-25 minutes, or until cheese is melted and bubbly. Remove from oven and let cool 5 minutes before serving. Enjoy!